Untuck and get comfy… it’s time for another love story! Director Ira Sach will debut his highly anticipated semi-autobiographic romantic drama ‘Keep The Lights On‘ at the movies tomorrow (Sept. 7th). The film “chronicles an emotionally and sexually charged journey of two men in New York City through love, friendship, and addiction. ” A closeted lawyer and a documentary film maker come together though a “casual encounter.” After finding love between each other, they discover they love drugs and other people even more. The relationship lasted ten years. So somebody must have been (getting their bills paid or) laying the pipe right if you ask me. 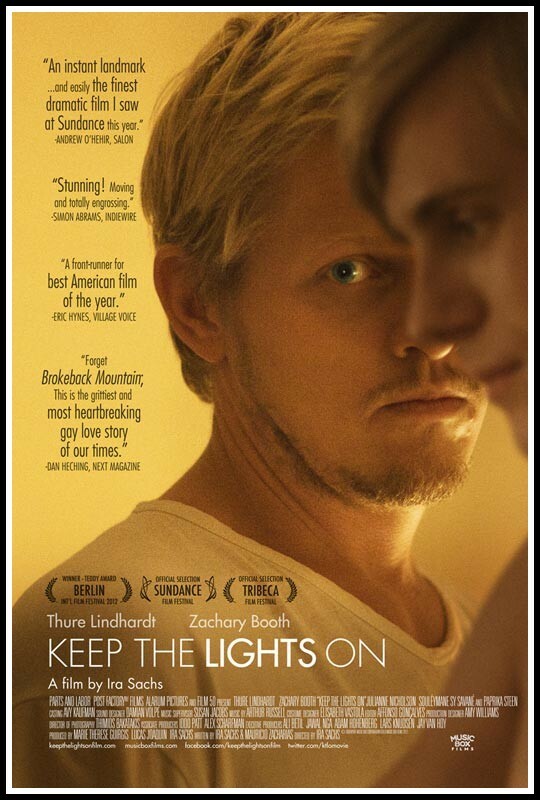 Will you be seeing ‘Keep The Lights On’ this weekend?I want to! Gay Film 'You Are Not Alone' Premieres This Weekend!